Ever since penthouse apartments became popular in the 1920s, hotels have tried to offer the same level of luxury. 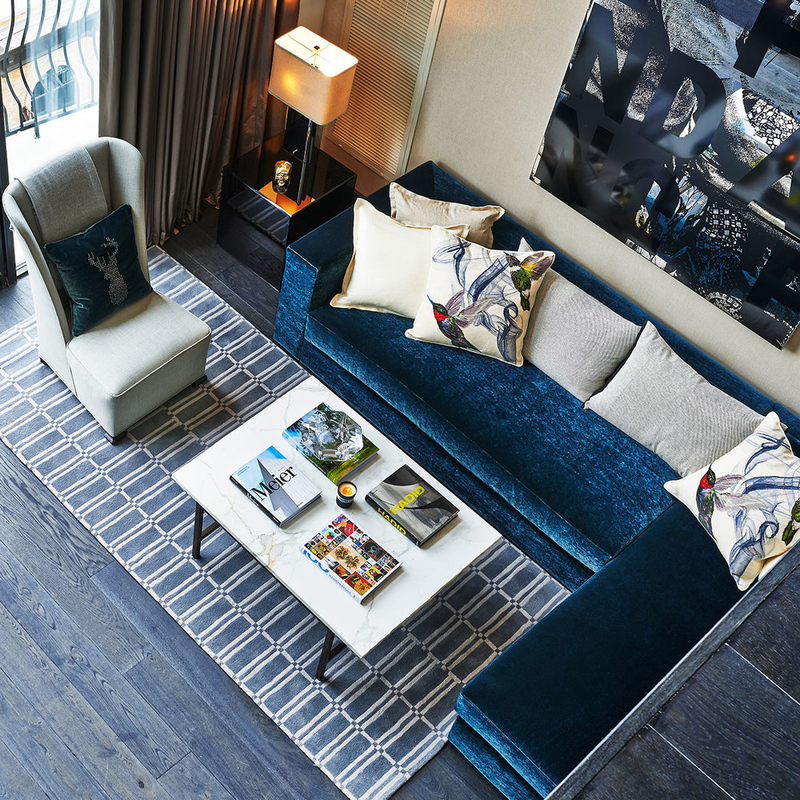 Who doesn’t want to stay in a top floor suite with soaring views far away from the hustle and bustle of the city street? Today it’s not just the Peninsula Hotels of the world who have penthouses. Even boutique properties like the new Press Hotel in Portland, Maine are offering penthouse suites due to a growing demand for this type of accommodation. Hoteliers say guests want to feel like they’re staying in an apartment (albeit with luxury perks) rather than a cookie cutter hotel room. Here are 12 new penthouse perches from a two-story suite in Paris with an exotic terrace to a rock and roll retreat on New York’s Lower East Side that may make your head spin. Turns out the air really is better up here. The Royale Oriental Suite’s 800-square foot terrace makes it one of the most covetable luxury suites in Paris. 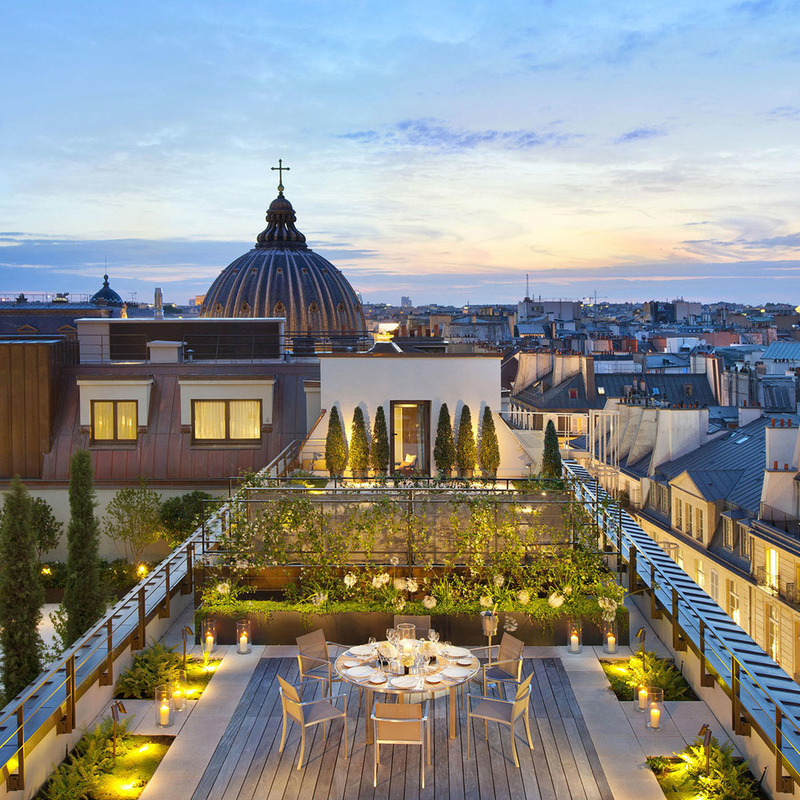 The views are of the iconic Parisian rooftops but the terrace itself transports you to Bali with a hand-carved pergola, ipé wood floor, and camellia and star jasmine bushes. It also has a retractable roof allowing it to be used as an outdoor dining and living room in all seasons. Inside the split-level suite the East-meets-West theme continues with ebony and velvet accents, a staircase embellished with sculpted butterflies and floral-patterned drapes. Upstairs, the bronze colored bedroom has an oversized headboard with embroidered flowers by Maison Lesage. The revered French embroidery house has done haute couture embellishments for Chanel, Lanvin, and Givenchy. Rates from $16,094 a night. 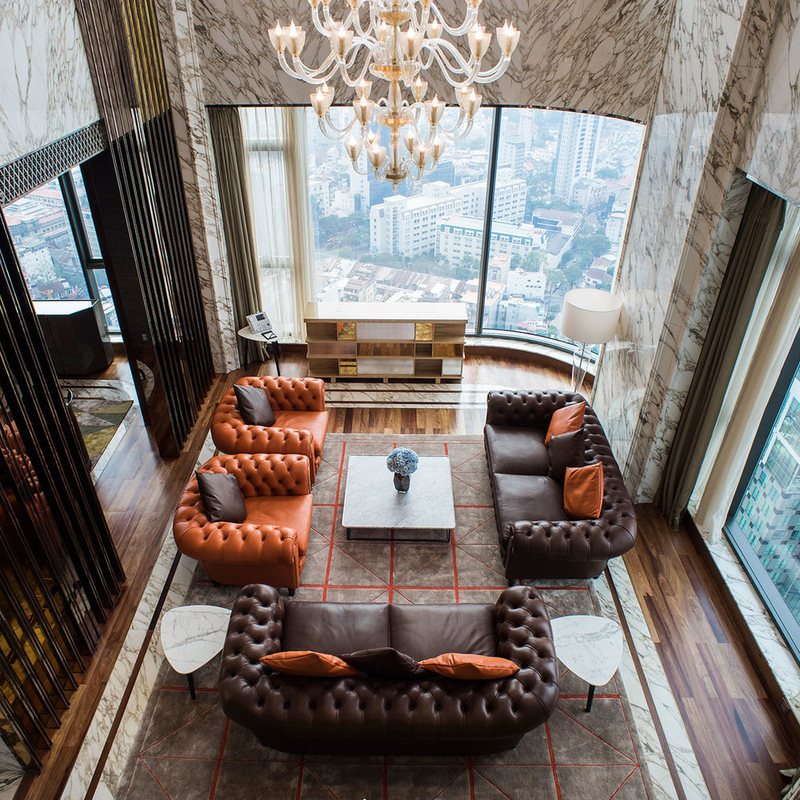 The Reverie Saigon, open since September, is setting a new luxury standard in Ho Chi Minh City, and the Saigon Suite on the 38th and 39th floors of the hotel is the jewel in its lofty crown. The one-of-a kind suite designed by Cassina and Poltrona Frau, two Italian design houses, is an homage to 20th-century design. With stunning views of the sprawling city and the Saigon River, the suite's furnishings include Frank Lloyd Wright wooden barrel chairs, a Le Courbusier lounge chair and a vintage wooden trunk repurposed as a minibar in a sitting room. The nearly 3,000 square foot suite comes with dedicated butler service, something that seems like a pre-requisite among the best accommodations in the world these days, and guests should take time to appreciate the Veliero bookcase in the living room. The nine-foot tall piece with glass shelves that suspend off an inverted v-shaped pillar is so technically advanced it wasn’t produced until ten years ago even though it was designed in the 1940s. Rates from $12,000 a night. 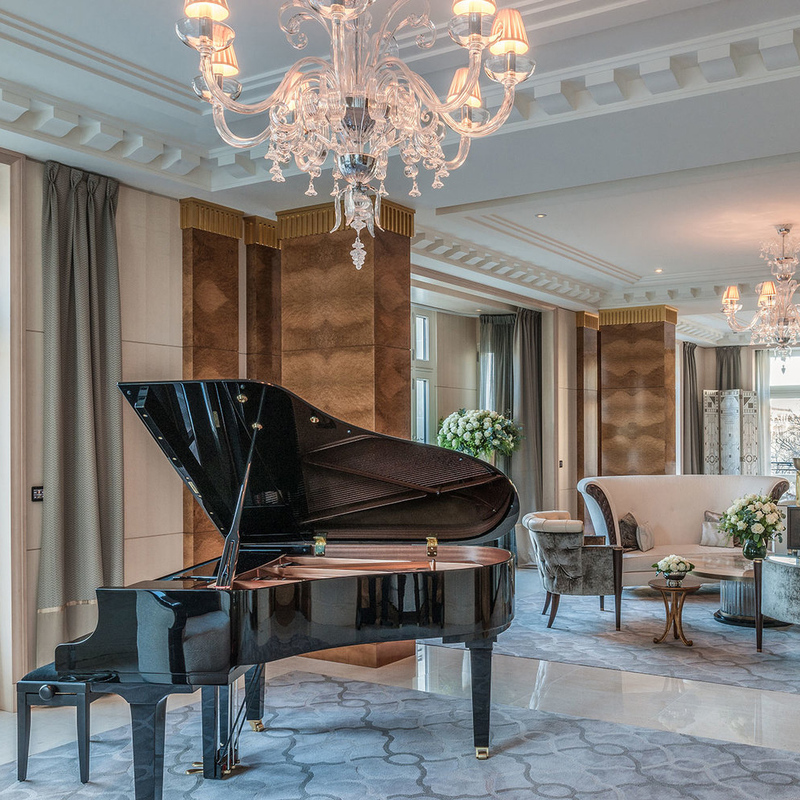 At 10,000 square feet, this penthouse suite at the Excelsior Hotel Gallia, a Luxury Collection Hotel, in Milan is the largest suite in Italy and it may also be the country’s most sumptuous with glitzy Art Deco-inspired décor and precious materials like marble and crystal gracing nearly every surface. The white and gold living room with slanted reflecting walls features some of the most iconic Italian furnishings like mushroom-shaped Atollo table lamps, and brilliant white Chesterfield sofas by Fendi. 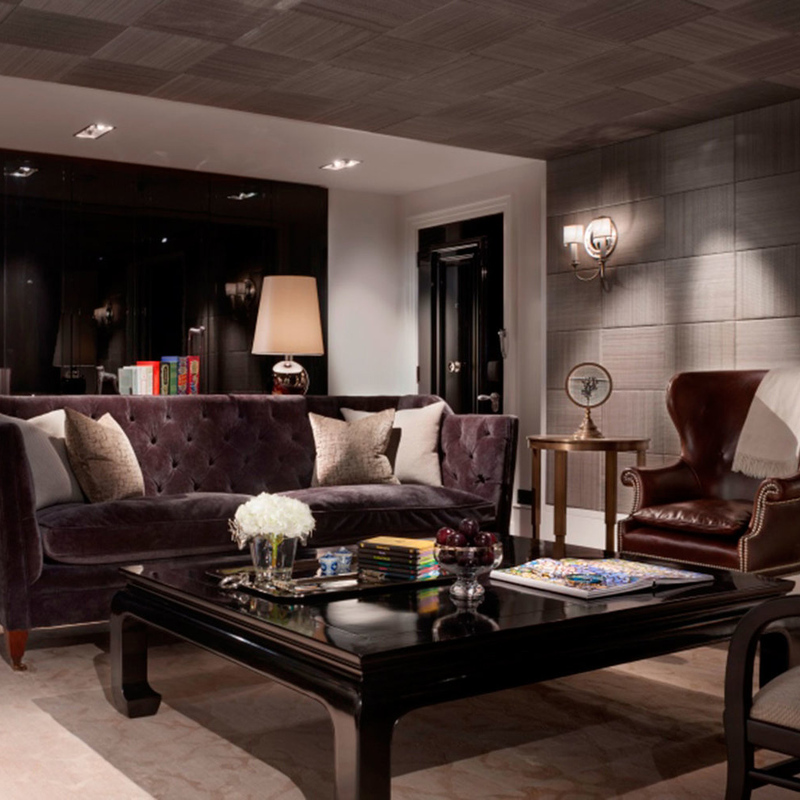 The penthouse’s four bedrooms are every bit as dramatic as the public spaces. The diamond-inspired Princess Room has a shell shaped headboard bed with a canopy of crystal and glass that drips from the ceiling. The suite is located on the 7th floor of the hotel, and two terraces overlook Milan’s Central Station. 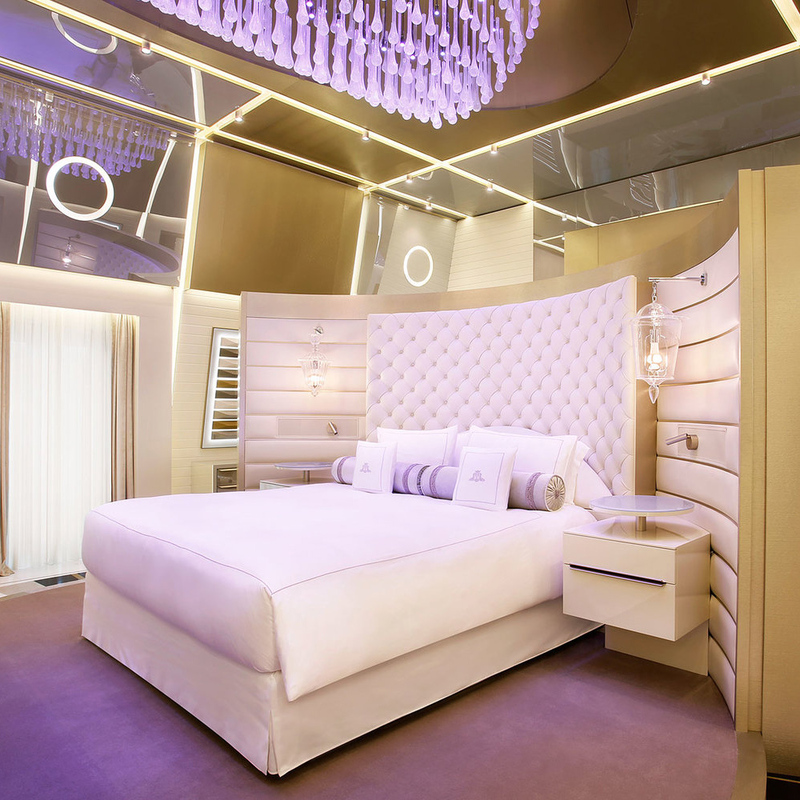 But the suite’s true piece-de-resistance is a private spa with a Turkish bath and a Jacuzzi showcasing a chromotherapy overhead shower and light fixture made of 720 blown glass bubbles. Rates from $21,495 a night. For decades La Jolla’s famed “Pink Palace” had a small restaurant on the 10th floor that served five-hour dinners but this past spring they decided to turn that real estate into the hotel’s premier accommodation. The Sky Suite has a 180-degree view of the Pacific and La Jolla Cove and retractable window walls make you feel one with the sky and sea. 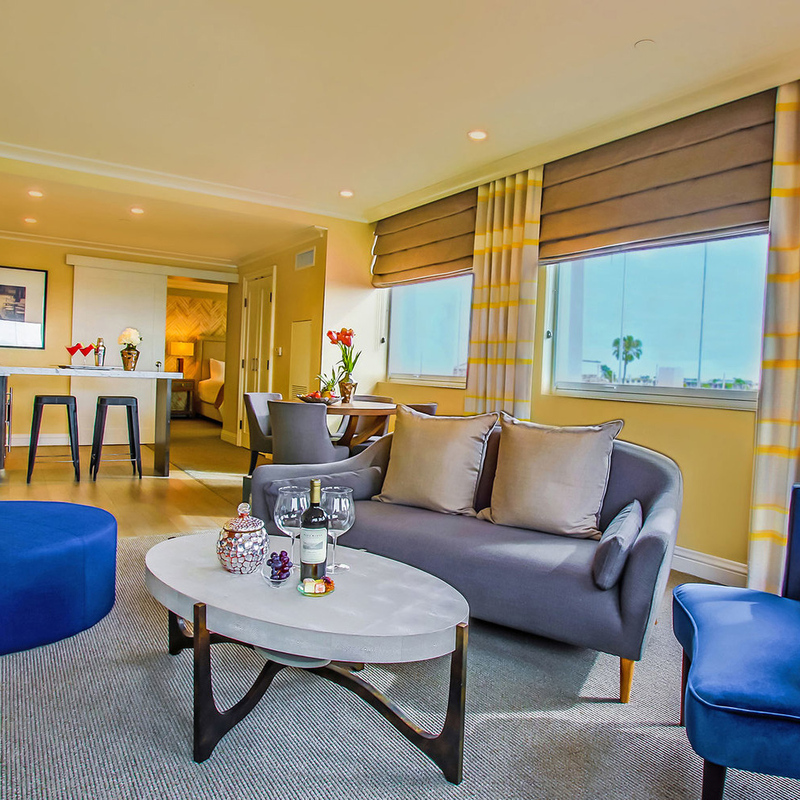 The two-bedroom suite epitomizes laidback So-Cal luxury. It has hardwood floors, low-slung chairs, geometric patterned curtains and Spanish mosaic wall tiles. In the master bedroom guests will find a Juliet balcony and a Carrera marble bathroom with a rain and steam shower. Customized service is a hallmark of La Valencia, and Sky Suite guests will be treated to a special welcome drink like a “make your own Pink Lady bar.” The hotel’s signature cocktail is made with basil infused vodka and watermelon juice. Rates from $1,200 a night. The Rosewood London’s Garden House Suite offers a true luxury in Central London with a garden terrace, fireplace, and views of most of the city’s landmarks like the London Eye and the Gherkin. Inside the one-bedroom suite feels more like a chic apartment then a hotel room with a light-filled sitting room and kitchenette, whimsical artworks, and vintage books chosen by the impeccably dressed Rosewood London Hotel Manager Michael Bonsor. Amiable butlers are available to cater to your every need day or night, but try to arrange your stay over the weekend so you can explore the Sunday Slow Food & Living Market in the Edwardian hotel’s inner courtyard featuring the artisanal butchers, florists and bakers. Rates from $13,850 a night. The Ludlow Hotel’s top suite, unveiled in July, is a luxury pad with a downtown vibe. 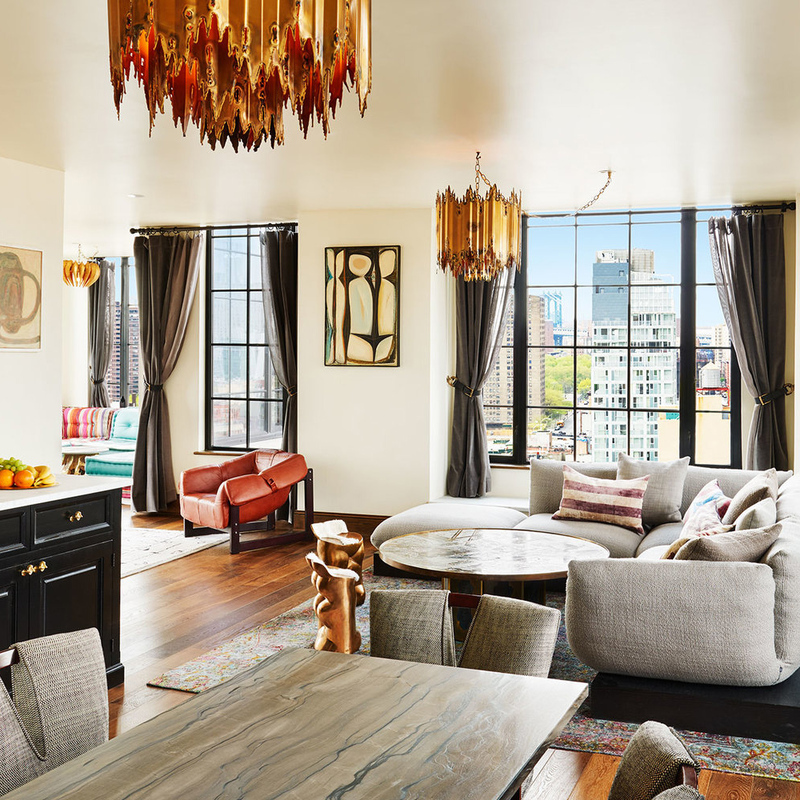 The 17th floor Penthouse is inspired by the Lower East Side of the 1980s, and furnishings feel like they’ve been handpicked by a globe trotting rocker: handmade silk rugs, Moroccan pendant lamps, and a king size Indo-Portuguese style bed flanked by petrified wood night stands. The Penthouse’s floor-to-ceiling warehouse casement windows let in loads of light and offer views of Manhattan and the Brooklyn Bridge, or for fresh air you can step out onto the suite’s 1,000 square foot furnished terrace nearly as big as the suite itself. A fully equipped kitchen and an entertainment center with vintage vinyl will make guests want to set up permanent residence. Rates from $1,950 a night. 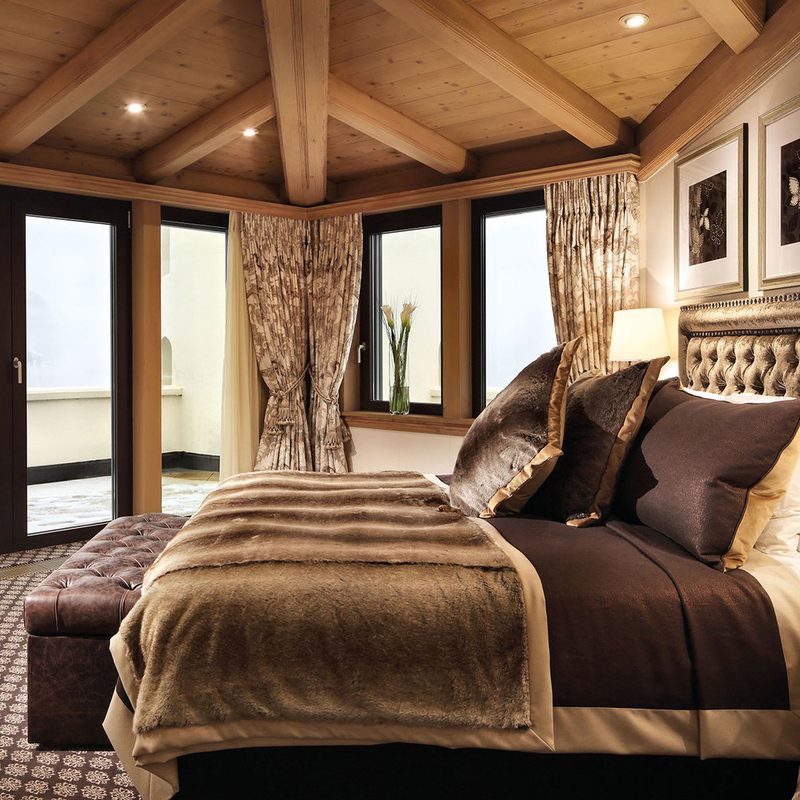 The Gstaad Palace capped off a major property refresh by unveiling its redesigned 7th floor suite this past summer. Proving penthouses are not only meant for the city, every room has spectacular views of the Bernese Alps. Interior designer Marina Nickel’s goal was to make the three-bedroom suite feel more like a mountain residence than a hotel room and the décor, think antler chandeliers hung from wood-beamed ceilings, a roaring fireplace and plush beds with fur pillows and throws, is luxurious but comfortable. The 100-year old Gstaad Palace hotel looks like a castle and the penthouse sits on the roof between the hotel’s four turrets (one even conceals a private sauna). The wrap around terrace has a Jacuzzi where you can take in panoramic views of the Saanenland region equally beautiful in winter and summer. Rates from $8,830 a night in summer and $10,099 in winter. At one time the 6th floor Katara Suite at the Peninsula Paris would have been divided into servant’s quarters, the former Hotel Majestic was built during the early 1900s when the best suites were located on the belle étage or second floor, but under the eye of designer Henry Leung it has been turned into the ultimate Parisian pied-à-terre. The one bedroom suite has hard wood floors, soft grey rugs, contemporary art pieces like a white blown glass chandelier over the dining room table and two spectacular outdoor terraces. The nearly 2,000-square-foot rooftop garden is the same size as the suite and offers a 360-degree view of the city including all the iconic landmarks like the Eiffel Tower and the Arc de Triomphe. When staying in the Katara Suite guests also receive three hours a day of complimentary access to the Peninsula’s Mini Cooper S Clubman for chauffeured sightseeing and shopping. Rates $19,000 a night. 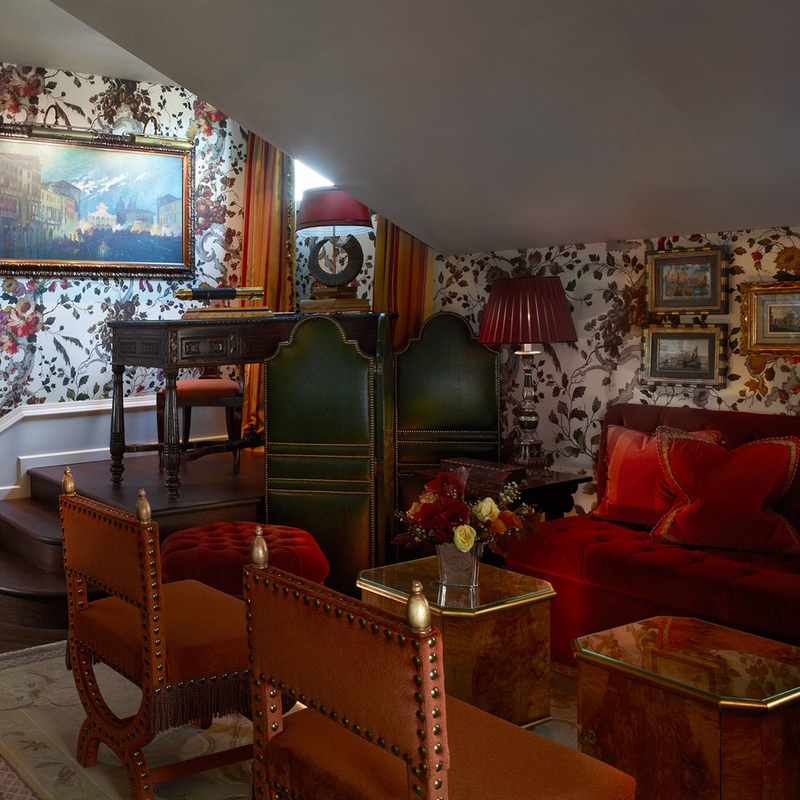 The refurbished SIXTY SoHo opened last summer and the hotel’s top floor Sixty Loft is a dreamy urban retreat. The loft’s designer, London-based Tara Bernerd, has combined contemporary furnishings: dark blue velvet club chairs, Alexander McQueen cushions and pillows, with vintage finds like antique globes. The 1,800 square foot split-level suite has a large roof deck off the second floor bedroom with views of 1 WTC and the Empire State Building. While the look is bohemian, the suite offers plenty of creature comforts—the four-poster bed has 400-thread count Sferra linens and there are two marble bathrooms with mosaic floors. One of the major perks of staying in the Loft is secret access to the hotel’s rooftop bar A60 (open in warmer months). While enjoying panoramic views sip on the Debutante's Mule with shiso-infused vodka, lemon, apricot and ginger beer. Rates from $4,500 a night. 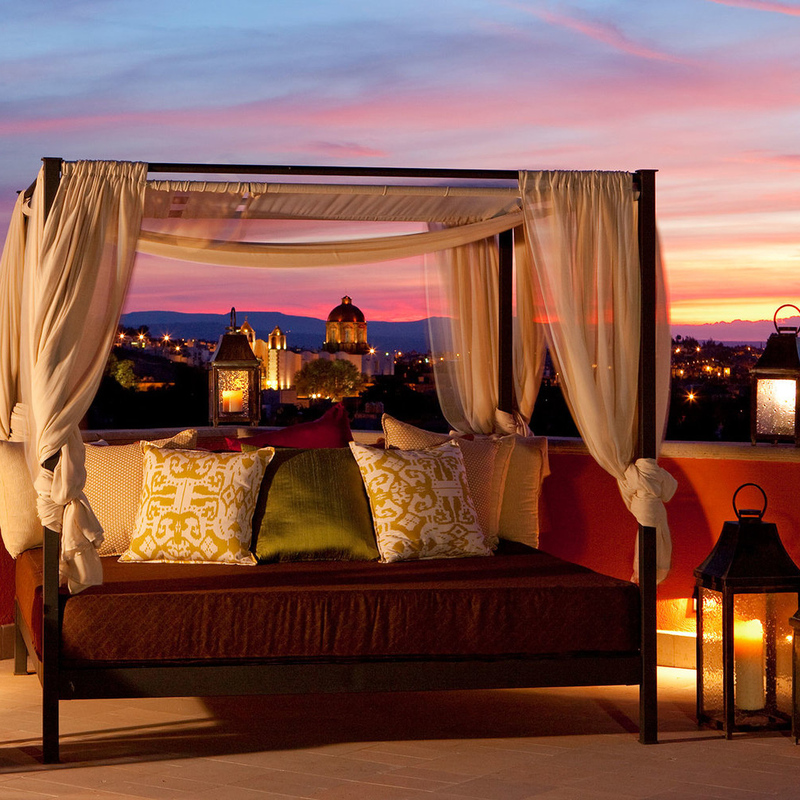 This 2,900 square foot suite, with indoor and outdoor lounges evokes a hacienda with wood-beamed ceilings, custom hand-carved furniture and antiques and a jewel-toned color scheme inspired by the artsy city of San Miguel de Allende. The Rosewood Suitewas renovated this year and it now sports a dramatic plunge pool with views of the city skyline dominated by the city’s famed pink limestone church La Parroquia. The Rosewood hotel brand prides itself on offering unique experiences at all its properties and guests of the suite are welcomed with adult and kids-sized easels and a set of paints and tools for creating one-of-a-kind pieces of art. For inspiration, position yourself on the foyer at sunset when the sky and the foothills of the Sierra Madre are awash in every shade of orange. Rates from $1,750 a night. Even affordable boutique hotels are seeing the value in offering a penthouse so when the Press Hotel in Portland, Maine opened in May 2015 it was proud to show off its 7th floor suite with ten-foot tall ceilings and a rooftop patio with views of the Old Port, the harbor, surrounding islands, and the Atlantic Ocean. 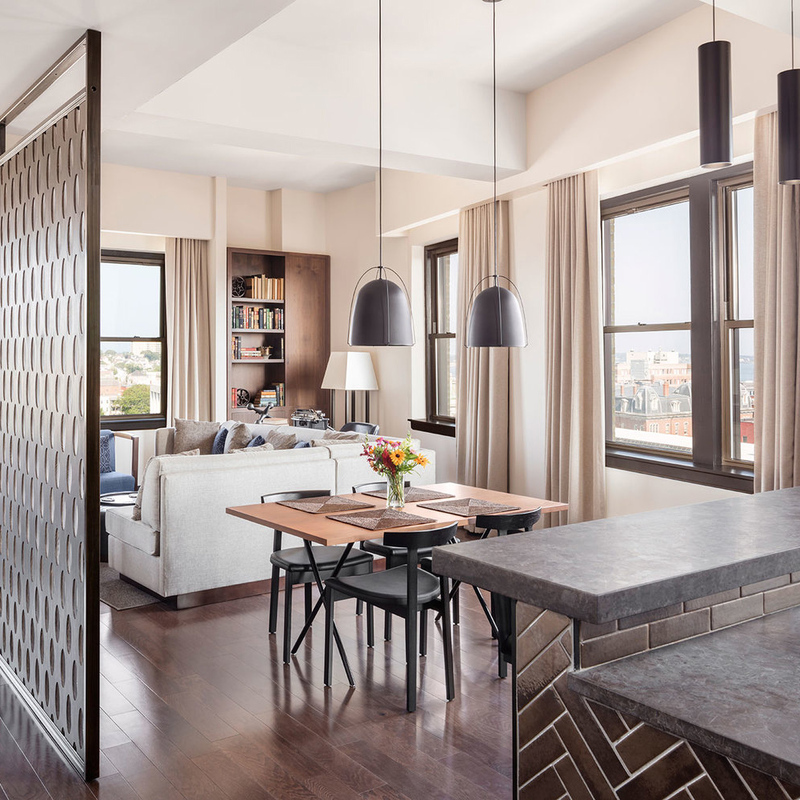 The suite’s open floor plan is functional and uncluttered with a kitchenette, a master suite with marble bathroom, and a living room with an elevated fireplace surrounded by porcelain herringbone tiles that seem to echo the cobblestone streets outside. The 90-year old building served as the offices and printing plant of the Portland Press Herald, the state’s largest newspaper, until 2010 and the tapestry brick and stone façade has been meticulously preserved. In the suite, you can channel the fast talking reporters of the 1920s while sitting at the writer’s desk with vintage typewriter or head down to the Inkwell Bar for a microbrew or craft cocktail, once the Portland Press Herald’s bustling “City Room.” Rates from $1,169 a night. This two-story retreat is reminiscent of a cozy attic apartment but with one major perk: one of the world’s most impressive terraces. The 2,700 square foot rooftop—accessible by a spiral staircase—has a white Istrian stone tile floor, a swimming pool and a 360-degree view of Venice and the Grand Canal. The one-bedroom Terrazza Redentore Suite debuted during the restoration of The Gritti Palace, a Luxury Collection Hotel, in 2013, and the look is classic Venetian with ornate mirrors, silk-damask walls, and hand-painted frescos. The cozy bedroom is covered in floral fabrics fashioned by Lorenzo Rubelli, a famous Venetian textile house founded in 1858. It would be a shame to keep the terrace all to yourself so guests are encouraged to hold celebrations, maybe an al fresco dinner for eight or a party in honor of the Redentore Celebration fireworks held each July. Rates from $9,756 a night.